Color: Light Rose Shimmer Rhinestone Biz is proud to offer the newest addition to from the line of SWAROVSKI® ELEMENTS. 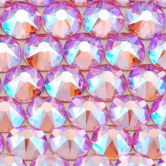 The 2088 Xirius Rose Flat Back Shimmer Effect Rhinestones. Swarovski Shimmer Effect adds more brilliance, color vibrancy and unique light refractions to your dance costumes and other applications. Its provides a softer, more elegant shimmer that radiates 3 shades of the base color to accentuate every move.